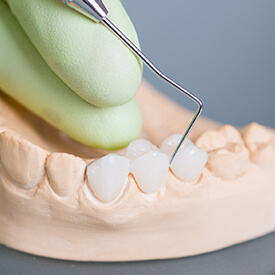 If you’ve lost one or more consecutive teeth, a fixed dental bridge can provide needed durability and coverage that will last for several years. At Roselle Park Dental & Implants, we offer both traditional bridge and implant-supported bridges as quality options that can help you regain your complete, confident smile. Please contact us today if you’re ready to schedule an appointment with our dedicated doctors and staff members here in Roselle Park, NJ. What Are The Benefits of Getting A Fixed Bridge? The new “teeth” will help you maintain your natural facial shape and prevent deterioration. Remaining teeth will be unable to shift out of position over time. Your ability to chew and speak successfully will be restored. Traditionally, having a new bridge created and placed within your smile will require two appointments. During the first visit, nearby adjacent teeth will be prepared for the placement of dental crowns; these crowns work as “anchors” that will hold the new dental bridge in place, essentially making it a permanent replacement. Our doctors will also place a temporary bridge while we wait for the dental laboratory to create the finished restoration. At your second appointment, the new, permanent bridge will be carefully inspected and minutely adjusted as needed before it’s cemented in place within your smile. Our team will provide you with all the information you need to maintain your new bridge so that you can enjoy it for many years to come!